Over a hundred people rallied at Grand Circus Park in Detroit, MI, following a march along Woodward Ave. demanding an end to war, violence and injustice. On July 3, the day before countrywide celebrations of the American Revolution, young members of the Michigan Emergency Committee Against War and Injustice (MECAWI) spoke out against mass amounts of money going to war and imperialism instead of education and health care, and the drive to bring back the draft to send more working class youth to die for capitalist interests. The Detroit Socialist Party, along with members of the Socialist Party of Michigan, mobilized to this rally and joined the demands for an end to the occupation of Afghanistaion and Iraq, the liberation of Palestine and money for education and health care. As the struggle against imperialism continued, members of the Debs Tendency, a tendency in the Socialist Party USA, distributed the first issue of the new Appeal to Reason, a publication originally published between 1879 and 1922 read by hundreds of thousands of working people. 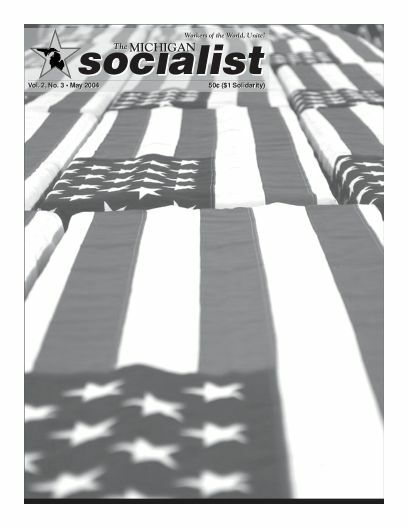 The Socialist Party of Michigan will continue its opposition to American imperialism until all US troops have come home! Socialist candidate for OCC Trustee receives over 11,000 votes! On Monday, June 14 school board elections took place across the state of Michigan and Carl L. Williams, Socialist Party member and Oakland Community College student, was on the ballot for OCC Board of Trustees. Carl received 11,675 votes, coming in a strong 6th place (out of nine candidates). This is a remarkable showing considering that the top four vote-getters were the three incumbents and a candidate with both wide name-recognition and previous office experience. Carl’s 11,675 votes translates to 10.1 percent. By comparison, the top vote-getter received 17 percent. This is a great showing for the first 2004 SP candidate in Michigan! Upon an overview of the votes broken down by district, Carl came in second place in Troy (Warren Consolidated District), and third place in Northville, Oak Park, Oxford and Southfield. Carl came in fourth in a handful of districts as well. In Southfield, Carl was a solid 344 votes ahead of the fourth place finisher. Click here for election results. While this was a non-partisan election, Williams made no secret of his affiliation with the Socialist Party, posting links on his website and discussing the issues with the workers and students of the school. He had wide support from the Socialist Party of Michigan, who posted information on all their websites. The SPMI – along with SP Vice President Mal Herbert – had a presence at the NAACP-sponsored debate as well. The areas in which Carl did best were the most working class, areas the SPMI needs to and will continue to focus on in the future. The SPMI is continuing its work on the fall campaign, running candidates in several state-wide offices. Click here for more information. Yesterday, working people across southeastern Michigan won a small but significant victory in the fight against corporate control. By a vote of 4-1, the Highland Park City Council voted down a plan to turn over control of its water system to privatizers. The fight against water privatization has been going on for well over a year. It began when the Highland Park Water and Sewage Department, which is part of the Detroit Water and Sewage system, began a series of mass shutoffs of residential water service, while leaving corporate customers untouched (even though the corporations account for more than three-fourths of the overdue money). The shutoffs began about the same time that Highland Park, facing severe economic crisis, was put into a form of receivership, and then-Governor Engler appointed an “Emergency Financial Manager” for municipal services. This overseer was installed in order to make all sorts of cuts in municipal services, as a means to “put Highland Park back on its feet”. The crown jewel in the plan of this unelected “Manager”, Ramona Henderson-Pearson, was to turn over control of the water system to a private management firm, the Rothchild-Wright Group LLC. It was this proposal that was debated and ultimately rejected at last night’s meeting. Residents of Highland Park united with anti-privatization activists from Detroit and across the state to oppose the plan. They packed two public hearings held by the City Council, the first on May 17 and the second yesterday, to demonstrate their opposition to turning over their water to a private firm. The stale formality that usually accompany such meetings went out the window within minutes of the Highland Park City Council President Pro Tempore Ameenah Omar banging the gavel. Residents refused to hold in their anger and disgust with what many regarded as a “dog and pony show” by the City Council members and the representatives of RWG. Every time that the representative of RWG — Mr. Wright himself! — evaded an answer, residents spoke up and demanded that he stop “shucking and jiving” and directly answer the question. This conscious evasion by Wright took place whether the questions came from the public or from the members of the Council. Members of the Detroit Socialist Party and Socialist Party of Michigan attended both public hearings at the request of members of the Highland Park Human Rights Coalition, the main community organization that sought to stop the privatization scheme. The DSP and SPMI comrades, joined at the first meeting by Mary-Alice Herbert, Socialist candidate for vice president, talked with Highland Park residents about the situation they are facing, with an eye toward working with them to find a real solution that works for the working people of the city. While those of us who attended the meeting may not have realized it at first, it became obvious at the meeting yesterday that our presence at these meetings had an impact. Wright, in attempting to evade yet another question from a Highland Park resident about the need to turn over the water system to a private company, launched into an attack on the Socialist Party. Calling us “streetcorner revolutionaries”, Wright sought to wrap himself in the colors of “America” and saw himself as representing “reality”. In reply, SPMI Chair Matt Erard stepped up to the speaker’s podium and explained that, for Socialists, the reality is that working people built this country and, in turn, that Highland Park, like the rest of the U.S., should work for working people. In closing his brief comments, Erard also made it clear that, in the Socialists’ view, water is a right, not a commodity, and pointedly asked Wright what kind of “reality” he lives in and seeks to bring to Highland Park. Our comrade’s comments draw loud applause from the people attending the meeting and stunned silence from Wright. As the meeting drew to a close, Councilwoman Omar took the opportunity to make a statement. She stated that when she came into the meeting, she was “totally prepared” to vote for the privatization scheme. However, because of the fact that Wright was unable to make his case before the citizens of Highland Park (and, though it went unsaid, his inability to deal with the “streetcorner revolutionaries”), she had decided to “vehemently oppose” the plan. As the formal vote tally rejecting the plan was read, Highland Park residents broke into celebration, as Wright and his sole support on the City Council, Frank Ross, quietly slipped out the back door. Residents and anti-privatization activists continued their celebration outside of the Municipal Building, congratulating each other and pledging to continue the fight. This last part is most important; speaking to reporters after the vote, Wright stated he and the privatizers “will not take ‘No’ for an answer”, and will keep on trying to take over Highland Park’s water. Even though Wright (and his pet Councilman Ross) would like to credit “the Socialists” and “streetcorner revolutionaries” for their defeat, all credit is due to the members and activists of the Highland Park Human Rights Coalition and, through them, the working people of Highland Park. They were the ones who kept on with the difficult work of organizing against the corporate colossus, and they deserve all the praise for keeping the city’s water system out of the hands of the corporate privatizers. The struggle continues, and we in the SPMI could not be prouder of our allies in this struggle.